Jordan Eck - STEER FOR STUDENT ATHLETES INC.
Jordan is a former collegiate student-athlete who graduated from Hamilton College in May 2013 with a Bachelors Degree in Communications. At Hamilton College, Jordan was a four-year starting quarterback and two-time captain for the Hamilton College Football team. During his time at Hamilton College, located in Clinton, NY, Jordan was a member of the Student-Athlete Advisory Committee (SAAC), which is designed for Hamilton College student-athletes to participate in many different projects to help the Clinton community. His professional work experience includes an internship with the United States Olympic Committee during the summer of 2012. Jordan grew up in Rye, NY, and attended Rye High school until he graduated in 2008. The son of Michael Eck, who serves as a Co-Chairman of Steer, Jordan was a standout high school student-athlete. He served as captain his senior year for the Rye Football and Hockey teams. 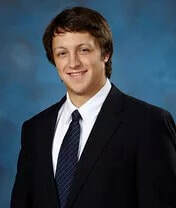 During his senior year, the Rye football team won the New York State Championship, and the Rye hockey team went on to advance to the quarterfinals of the New York State tournament. Jordan has always been a big advocate for giving back to his community. Jordan worked for Steer as the Coordinator of Operations, Administration and Student Support from the organizations inception in 2013 through 2017.